A Norfolk Broads cruiser, the boat "Fair Regent" is a cruiser belonging to the boat-yard Faircraft Loynes, and is good for exploring the rivers around Wroxham & Horning. 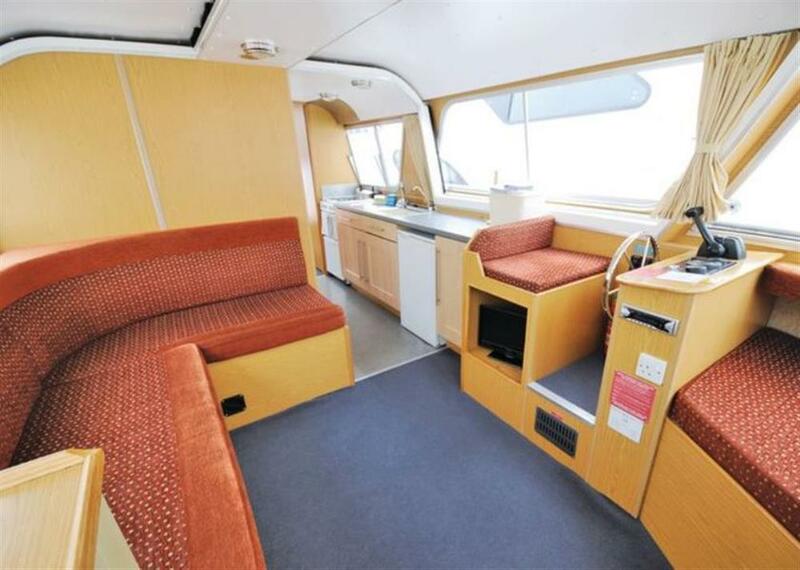 Fair Regent sleeps 4 people, with the bedrooms laid out as 1 double and 2 single. You control this cruiser from the forward. 240v system on boat. Keep warm in the evenings with the heating available. All the bed linen is available on Fair Regent. There is a TV on Fair Regent. There is a DVD player on Fair Regent. You can bring your CD collection with you, as this boat has a CD player. Enjoy the radio while cruising the waterways. You even get a hairdryer on board. You get the benefit of a shower on this boat. Plenty of space to park your car. Rent a dinghy with Fair Regent. Forward steering position on Fair Regent. This is the plan of Fair Regent. To give you an idea of the size of your boat, Fair Regent is 10.06m x 3.66m (33ft x 12ft). Fair Prince - at Faircraft Loynes, in Wroxham & Horning. Fair Executive - at Faircraft Loynes, in Wroxham & Horning. Fair Princess - at Faircraft Loynes, in Wroxham & Horning. Fair Senator - at Faircraft Loynes, in Wroxham & Horning. Fair President - at Faircraft Loynes, in Wroxham & Horning. Fair Aristocrat - at Faircraft Loynes, in Wroxham & Horning. Fair Viscount - at Faircraft Loynes, in Wroxham & Horning. Fair Chancellor - at Faircraft Loynes, in Wroxham & Horning. Fair Sovereign - at Faircraft Loynes, in Wroxham & Horning. Fair Countess - at Faircraft Loynes, in Wroxham & Horning. Fair Duke - at Faircraft Loynes, in Wroxham & Horning. Fair Emperor - at Faircraft Loynes, in Wroxham & Horning. Fair Entrepreneur - at Faircraft Loynes, in Wroxham & Horning. Fair Commissioner - at Faircraft Loynes, in Wroxham & Horning. Fair Royale - at Faircraft Loynes, in Wroxham & Horning. Fair Ambassador - at Faircraft Loynes, in Wroxham & Horning. Fair Duchess - at Faircraft Loynes, in Wroxham & Horning. Fair Jubilee - at Faircraft Loynes, in Wroxham & Horning. Fair Monarch - at Faircraft Loynes, in Wroxham & Horning. Fair Statesman - at Faircraft Loynes, in Wroxham & Horning. Fair Admiral - at Faircraft Loynes, in Wroxham & Horning. Fair Empress - at Faircraft Loynes, in Wroxham & Horning. Fair Majesty - at Faircraft Loynes, in Wroxham & Horning. Fair Diplomat - at Faircraft Loynes, in Wroxham & Horning. Fair Commodore - at Faircraft Loynes, in Wroxham & Horning. Fair Regal - at Faircraft Loynes, in Wroxham & Horning. The Cruiser above is Fair Regent - in the Faircraft Loynes region of Wroxham & Horning. We've also listed several other boats in Faircraft Loynes; or for a bigger choice, look at all the boats available in Wroxham & Horning. Hopefully you'll find something to suit your holiday needs!